Hooray! I took the day off from the bookdealer's. Instead of going in to catalogue ancient literary criticism texts, I went to see my jetsetting parents off to the airport for their all-inclusive resort trip to Aruba. Then I went to the mall. Oh the mall, how I love the mall. Instead of making a little bit of money, I decided to spend a whole bunch of it! It is these irresponsible decisions that ensure that I will stay firmly rooted in adolescence, even if I am 30 years old (I keep reminding you of this -- it still fills me with wonder that I am 30!). 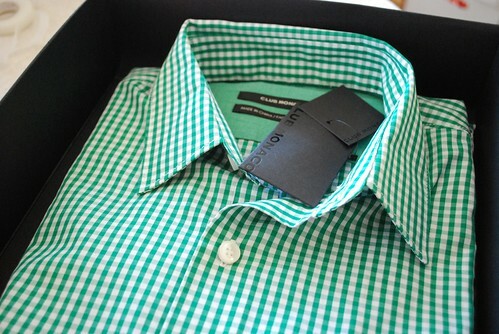 I bought Geoff this green gingham shirt at the mall. A slim fit, extra small. Oh my little darling. I hope he likes it because I can't return it. Yikes! The lovely young man in large glasses and a bowtie who helped me dig out the one extra small from amongst the many larges and extra larges asked me if I was a university or college student, because I would get a discount. I said that I wasn't, and he said I looked like one. I wanted to hug him. Then I went to H&M where I bought these ridiculous lavender (lavender again!) sunnies. This is the trashiest photo I will ever post -- I am feeling brave today! Me in my underwear showing you the tattoo I got when I was a teenager. I know, I know, 'tis a beaut! In any case, there is a certain young lady arriving in Toronto soon; when you arrive I promise to spirit you away for the occasional ridiculous accessory binge at H&M. Sometimes a pair of $4.90 lavender tights does wonders for the poor soul who is writing papers on metadata retrieval & whatnot. I can testify! Here are my new lavender tights, worn with my Frye t-straps. Oh, you noticed my mismatched ankles? Yes! One of the perils of living in the hinterland is ice. Sometimes one falls and breaks one's ankles and they never heal in a pretty way again. Now I am at home, Geoff has come through the door, I have fresh coffee, and Belle & Sebastian playing. I am also admiring the recipe cards I got for my friend Kate for her birthday. They arrived today: custom letterpress cards from The Petite Press. I am in awe of these cards! Inexpensive ($18 for 20), beautiful, and the packaging was so lovely! I know Kate will like them. She has the prettiest name! sounds like such a lovely day! 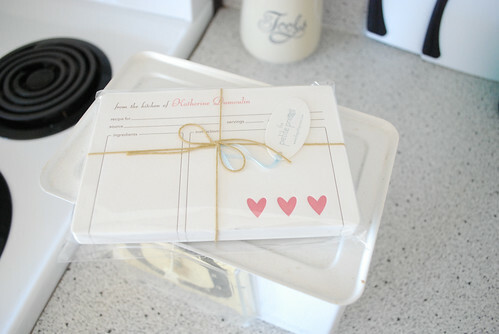 the recipe cards are such a great idea, and i can't believe how affordable they are. now i feel like going to target or h&m and living it up, too! I cannot wait for accessory binges with you. Sounds like a wonderful day! The weather was gorgeous this afternoon. And! You do NOT look 30. In fact, I thought you were younger then me! You are adorable with your adventures. & I agree that April is a comedic genius--I wish I was half as clever. i love your many moods! oh, how i love those tights! i think i need some... yes. i do. 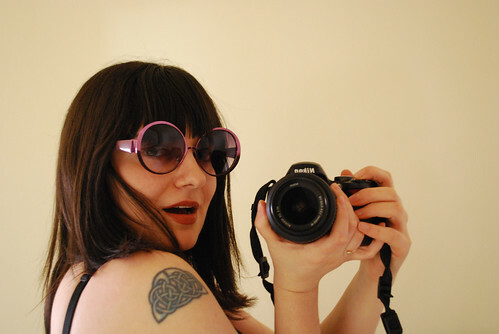 your tattoo... those glasses... and in your skivvies! what an awesome photo! that photo is awesome! and i love the purple tights. I think geoff would look great in that shirt! Only few people can pull off a shirt like that. I was curious about your tattoo! sounds like a perfect day. i should take days off like that more often! wheee! how awesome for you to share that cute moment when you were having fun with yourself. it made my night. Adorable! I love that photo of you! you look so cute! And, that tattoo isn't bad! From the way you described it, I thought it must have been a tattoo of Hello Kitty or something....now, THAT could be bad, but this...not so embarrassing. Sorry you hate it though. At least it's not in a conspicuous spot!